When it comes to sheer psychosis, the Joker is at the top of Batman's trouble list. But right behind him, and closing fast, is Roman Sionis, the criminal Black Mask. Roman Sionis carved a black mask from his father's coffin and turned to a violent life of crime. When a fire burned the mask onto his flesh, he became the Black Mask! Joker is a cartoony psycho - poisoning fish, fashioning big blimps with his likeness, that sort of zaniness. Black Mask, meanwhile, is a more down-to-earth sort of insane. Sure, carving a mask from your father's coffin may seem really out there, but that was just about the tamest thing the guy's ever done. For example, an average day might include torturing a man to death, then forcing his widow to eat pieces of the man's corpse. Black Mask does things that would make the mastermind characters in Saw, Hostel and Wolf Creek crap themselves in fear and disgust. Black Mask was originally a fairly mundane gangster, heading the False Face Society and generally trying to act tough. The blossoming of his sadistic prowess, however, coincided with a rise through the ranks of Gotham's underworld, until he was the man running the show, controlling everything illicit. The writers did a really nice job with him, turning from a forgettable loser to a first-class threat, and now DC Direct has a figure of him, available in the first series of Secret Files figures - Rogues Gallery. Black Mask used to look like an average guy, even after he was scarred in that fire. Recently, however, he's become much more skeletal. He looks like the Red Skull's brother, these days, with the stub nose and the exposed teeth, and all. Reminding us that it really is skin and not bone, he still has ears, though his throat looks like an exposed trachea. 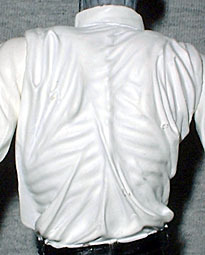 The sculpt suggests that more than Roman's face and head look like a cadaver - his wrinkly white shirt clings to his body, giving us hints of a ribcage on the front, and ribs, shoulder blades and a spine on the back. His arms, at least, are still human for some reason, and the legs inside those pants seem fully formed, as well. All his clothes seem a bit too wrinkled - either he's living out of a suitcase, or the sculptor was trying too hard for realism, and ended up going overboard. There are some nice details, like the stitching on his shoes or the pocket on his shirt, but in general it's a bit too much. In an odd way, the figure's simple paint apps help that. He's just wearing black pants, a white shirt and a black tie, but there are no washes anywhere. Because of that, the sculpt isn't being exaggerated by the paint, so the wrinkles flatten out a bit when you look at him. There's a bit of paint mess where the clean white shirt meets the pitch-black pants, but with flat colors like this, you could fix it with a Sharpie. The dark grey they chose for his head is really nice, and let's give up a big round of applause for the fact that his gloves are glossy rather than matte. Those aren't part of a high-class suit, they're latex gloves: Black Mask is planning to operate. 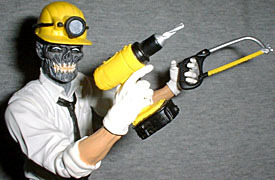 To let you play doctor (Mengele) with Black Mask, he comes with some proper surgical equipment. Ha! Just kidding. He's got a hacksaw, a power drill and a hardhat with a light on it. The hat speaks to his whimsical approach to his work, with the saw and drill show just how brutal he's capable of being. In order to give him nice, menacing poses, BM moves at the knees, hips, wrists, elbows, balljointed shoulders and balljointed neck. Black Mask's transition from unknown character to full-on arch-enemy was really nice. Rather than create a new character to fill a role (like Bane or Hush), the writers used one who was just hanging around unused. Making him a psychotic sadist both suited what we already knew about the character and gave him a new purpose in the stories. He's made great strides toward becoming Batman's #1 foe. Heck, he even managed to kill a Robin, something only Joker managed before - and unlike Joker, so far his Robin has stayed dead. This guy is a genuine sicko, and will look great with the rest of your Arkham inmates.